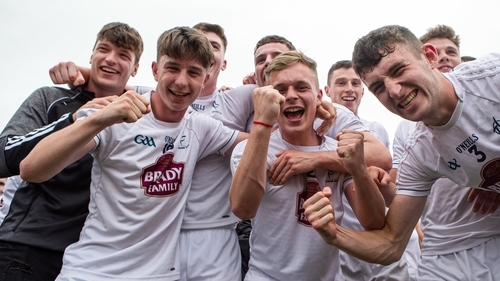 Kildare are into the All-Ireland Under-20 Football final after a brilliant performance helped them defeat Kerry by a point in the Gaelic Grounds in Limerick. Jimmy Hyland again proved miracles for the victors as after scoring eight points in the Leinster Final victory over Dublin, he followed it up here by scoring 1-08 with 1-06 from play. Kildare looked the better team for long stages and led by seven points after Hyland found the net in the 47th minute but Kerry battled back bravely and got back to within a point as they were helped by a Michael Potts goal but they couldn’t find another score as Kildare held on. Fiachra Clifford got the first score of the game when he pointed a free off his left foot to edge Kerry in front. Kildare did soon overturn the lead though with Jimmy Hyland getting his first point before a patient move resulted in a Paddy Woodgate score from distance. Kerry looked threatening every time they attacked though and centre back Graham O’Sullivan powered forward to score and bring the teams level at 0-02 apiece. Mark Ryan then kicked Kerry into the lead as he got on the end of a patient move which ended with the combination of David Shaw and Donal O’Sullivan finding the midfielder in space. Kildare were growing in confidence the longer the half elapsed though and Hyland in particular was beginning to cause trouble for the Kerry defence and he scored to retake the lead when taking advantage of poor Kerry kickout after an earlier Brian McLoughlin free had brought the teams level. Clifford duly added his second free of the half in response but Kildare were playing with a real swagger and they kicked three points on the bounce between the 11th and 14th minutes with an excellent brace of scores from Hyland made all the better by an Aaron Masterson score from 45 yards out. Kildare were showing they were a real threat on the attack but so were Kerry with another Clifford free narrowing the gap. McLoughlin was winning every ball played into him and he sold the Kerry full back an exceptional dummy before scoring off his trusted left point and a fifth Hyland point looked to have Kildare in command as they led 0-09 to 0-05. Kerry were the All Ireland champions at the equivalent minor grade two years ago and despite being without the star quality of Sean O’Se and David Clifford they still possessed plenty of class and they had the lead back to one point by the halfway point as Clifford added another brace of frees before Bryan Sweeney scored from play as Kildare held a tentative 0-9 to 0-8 lead after a very enjoyable opening period. Paddy Woodgate kicked Kildare two ahead when a quick Aaron Masterson free went into his grasp and he shot over on the turn. Kerry ended a ten minute barren period with a Donal O’Sullivan free leaving just the minimum between the sides as Kildare held a 0-10 to 0-09 lead. Kildare were about to hit their best patch of the game however as they hit 1-03 without reply at such a crucial stage. Two Hyland points either side of a McLoughlin score powered Kildare into a 0-13 to 0-09 lead but the game winning score soon arrived in the 47th minute. A poor short free kick by Kerry full back Stefan Okunbor went straight to half back Ruadhan O’Giollan and he powered past a few Kerry defenders before offloading to the sharpshooter Hyland who rounded Brian Lonergan to push Kildare seven points clear. Hyland scored another free a few moments later but from there it was all hands on the pump as Kerry threw everything at Kildare. A Donal O’Sullivan free reduced the lead to six while sub Michael Potts scored a super goal on the run. Further points from Dara Moynihan, Cormac Linnane and Sean O’Leary in stoppage time got Kerry within one and they looked set to force an equaliser to force extra time. No matter how hard they tried though they couldn’t find another point and Kildare held on to take their place in the final. Kildare: Aaron O’Neill; Mark Dempsey, Mark Barrett, DJ Earley, Stephen Comerford, Jason Gibbons, Ruadhan O’Giollan, Aaron Masterson 0-01, David Marnell, Darragh Ryan, Padraig Nash, Tony Archbold, Jimmy Hyland 1-08 (0-02fs) Brian McLoughlin 0-03 (0-01f), Paddy Woodgate 0-02. Subs: Shane O’Sullivan for Marnell h-t, Mark Glynn for O’Sullivan 35 mins, Jack Bambrick for Ryan 37 mins, Cian Costigan for Nash 44 mins, Sam Doran for Woodgate 54 mins, Niall Murphy for Hyland 62 mins. Kerry; Brian Lonergan, David Naughton, Stefan Okunbor, Michael Reidy, Mike Breen, Graham O’Sullivan 0-1, Daniel O’Brien, Mark Ryan 0-01, Diarmuid O’Connor, Fiachra Clifford 0-05 (0-05fs), Eddie Horan, Dara Moynihan, Donal O’Sullivan 0-02 (0-2fs), Bryan Sweeney 0-01, David Shaw. Subs: Sean O’Leary 0-01 for Naughton 36 mins, Brian Friel for Horan 44 mins, Cormac Linnane 0-01 for Shaw 51 mins, Michael Foley for Breen 52 mins, Michael Potts 1-00 for Clifford 55 mins, Cian Gammell for Ryan 57 mins.